Desi Cow Bilona Ghee is made from the Pure indian breed's desi cow's milk. The ghee is manufactured by the bilona process. In this process, first milk was transferred into curd. Then it is churned and the butter & butter milk are extracted from it. Then the butter is converted into ghee by boiling it. 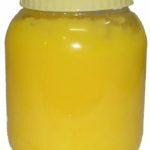 This is the best process to make the ghee from milk. This ghee contains the highest nutrition and quality. Desi Cow Ghee is made from the Pure indian breed's desi cow's milk. The ghee is manufactured by the below process. Desi Cow Milk is milked from cow. Cream is separated from Fresh Desi Cow Milk and Skimmed milk is generated as by product. Separated cream is boiled and ghee is made out of it. This ghee is called Desi Cow Cream ghee. Because of by product of skimmed milk, this is cheaper in price than the Desi Cow Bilona Ghee. 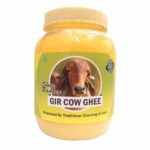 Gir Cow Ghee is made from the Pure Gir cow's milk. The ghee is always manufactured by the bilona process. Ghee making process is as per below. Milk is transferred into curd. Then the curd is churned and the butter & butter milk are extracted from it. Then the butter is converted into ghee by boiling it. This is the best process to make the ghee from milk. 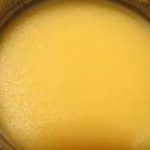 The Gir Cow ghee is the best high quality ghee among all cow ghee on this earth. This is very costly ghee and also used in medicinal usage. Mangalam Organic Products is the biggest supplier of "Organic Products in Ahmedabad". We are selling organic products in bulk and retail both. We are committed to quality and honesty. Now a days health is a big issue for everyone. Organic Products will save the health of people and also give good taste in food. Normally organic products are costly in price but it saves a lot of money which are spent in doctor's bill. So in end it saves money. We have Authentic Organic and Certified Organic both type products available. We buy Authentic organic products directly from farmers who are doing organic farming and they have certificate of this. We are doing research in organic food category since last many years and reach to this level. We have also deep knowledge of indian culture and eating tradition. We also get knowledge from Rajiv Dixit and other Vaidya for healthy food products.